Due to the high specific gravity of the slurry, the solids or particles have a tendency to settle when it is left for extended periods of time. Air must be injected to ensure the lime and other particles remain in suspension prior to pumping. The slurry is very abrasive and the pump must withstand this and have the ability to run dry. 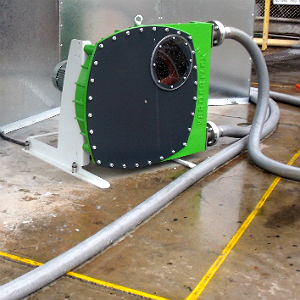 The customer liased with their local distributor, Global Pumps, Australia, leading to this unique project being specified and supplied with a Verderflex peristaltic hose pump model VF65. The VF65 has a maximum flow rate of 27.2 m3/hr and can comfortably handle the 20 m3/hr required by the client. The benefit of the VF65 is that the lime slurry is isolated from all moving parts of the pump and is contained within the suction hose. With only one wearing part (the hose) exposed to the abrasive nature of suspended lime, the VF65 has less down time and maintenance then other types of pumps. Replacing the vacuum trucks with the Verderflex peristaltic hose pump has simplified and cost-effectively streamlined the slurry transfer process for the client. The VF65’s durability prevents unnecessary down time due to reduced maintenance and mechanical failure.